Woodland Survival Crafts was established in 1995 by Dave Watson following a 10 year career in outdoor activity centres. 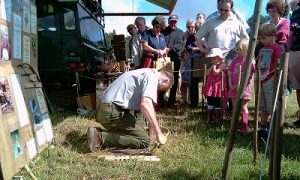 Initially, Woodland Survival Crafts was set up to provide adult education and schools’ programmes at a variety of outdoor centres in Shropshire and Worcestershire. It became clear very early on that bushcraft was a tool which excited and inspired everyone. It is an excellent tool to teach life skills, environmental education, and history as well as being a perfect basis in which to impart sound spiritual lessons. By 2001 Dave was being used increasingly to provide services for teenagers and young adults, especially those with low academic ability. Dave has spent a great deal of time developing programmes for young people; especially those who struggle with more conventional education, and has regularly witnessed dramatic and outstanding results. There are various ways to describe the differences between ‘bushcraft’ and ‘survival’, but what really sets true bushcraft apart is attitude. At Woodland Survival Crafts we understand that in wild environments it is vital to harness natural resources and work with them rather than against them. For example, successful use of the bow drill set is not about how fast and furious you can work it – your natural fibre wouldn’t survive the strain. It’s about care and efficiency which takes so much less energy and is actually quicker. This same attitude applies just as much in the way we believe in treating people. Our aim is always to bring out the best in whoever we work with or for. However, we don’t believe in being soft! You need a certain toughness to survive in the wilderness, but also, in normal everyday life, you can’t really help yourself or others without facing up to reality. We have become well known for our Friction Fire Demonstrations and can be seen at a range of events across the country.